When I put together my list for the Classics Club back in December 2015, I included a few translations alongside various British and American novels I had been intending to read for a while. 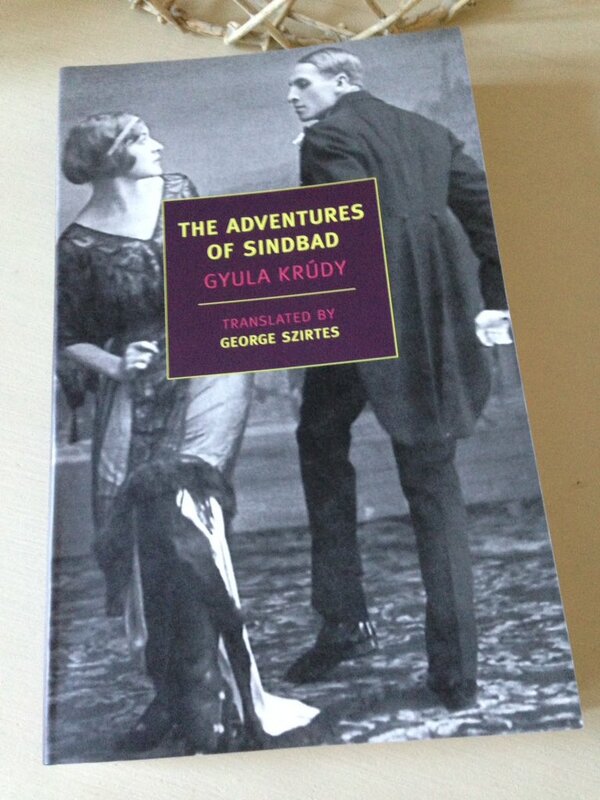 The Adventures of Sindbad was one of my random picks, a collection of interlinked stories by the Hungarian writer Gyula Krúdy (the pieces were originally published in journals/magazines from 1911 to 1917 and then collated together in this volume in 1944). Krúdy was something of a literary star in his day, producing over fifty novels and some three thousand short pieces before his death in 1933. The Adventures of Sindbad comprises a series of stories and sketches featuring the titular character, Sindbad, a sort of Hungarian Don Juan, whose reminiscences of times past are recounted in this somewhat strange and haunting book. Over the course of this book, Sindbad recalls the various women he has loved and lost over the course of his life. From peasant girls to countesses, from widows to actresses, Sindbad is hugely possessive over his conquests, often expecting them to remain faithful to him even when he has forsaken them for another. Here is a man with rather unrealistic expectations of his lovers, whose view of love is highly idealised, passionate and romantic. To Sindbad, love is everything; if there is no love, what is there left to live for? While there is little plot to speak of here, the sketches are packed full of vivid images. Pictures of these characters in their natural surroundings come to life in Krúdy’s hands. Sinbad is especially fascinated by his conquests’ clothes. In his eyes, all women look the same when they are naked – but when they are dressed in all their finery (or not-so-finery), that’s another matter altogether. He has a penchant for a finely turned ankle, especially when it is clothed in a delicate stocking. Hungary suffered heavily in the dissolution of the Austro-Hungarian Empire at the end of the First World War, and I think it’s possible to detect a sense of this pain in Krúdy’s stories. As George Szirtes explains in his excellent introduction to the NYRB edition of this book, the country lost two-thirds of its land and one-third of its population to neighbouring territories when the Treaties of Versailles and Trianon were agreed. Krúdy’s tone is highly melancholy and elegiac; the veil of nostalgia lies over every story, and the shadow of death – suicide, in particular – is never far away. (Sinbad is heavily preoccupied with his own mortality, and thoughts of his impending death feature in several of his reminiscences from the afterlife.) Interestingly though, Krúdy’s style could also be described as modernist, a feature that provides a fascinating contrast to the long-established, traditional world he depicts in these sketches. There are early elements of magical realism here as Sinbad’s spirit comes back as a sprig of mistletoe; and then he wonders whether it might have been more interesting to return as an ornamental comb instead – perhaps so. Either way, there are playful notes in some of these stories, ironic touches that serve to balance some of the underlying sadness and sense of loss. I think I heard about this book via Emma at Book Around the Corner. As Emma quite rightly points out in her excellent billet – do read it – these stories need to be spaced out over time. There is some wonderful writing here, sumptuous and evocative in style; but as with anything rich, it is best consumed in small doses. If I have a criticism of these pieces, I would say that for me they lack an element of differentiation. After a while, there is a tendency for several these individual romantic encounters to merge into one. For the most part, the objects of Sindbad’s attention are lightly sketched in terms of character/personality, an approach that doesn’t always make it easy to distinguish one story from the next. Nevertheless, I’m glad I decided to read this collection; I think it would suit lovers of European literature, particularly those interested in the Austro-Hungarian Empire in the early part of the 20th century. Fans of Gaito Gazdanov’s work should take a look at these stories too; there are some interesting parallels between these writers, particularly in terms of tone and themes. The Adventures of Sindbad is published by NYRB Classics; personal copy. This entry was posted in Book Reviews, Krúdy Gyula and tagged #TranslationThurs, Classics Club, Fiction, George Szirtes, Gyula Krúdy, Hungary, Literature in Translation, NYRB Classics, Short Stories on May 30, 2017 by JacquiWine.